Disclaimer: There's a little trouble in Texas today as two of our hosts are located was experiencing weather issues interfering with internet quality. (1:20) Captain Paul shares with us detail from the Sea Shepherd global meeting with countries to curtail poaching, how they've arrested a vessel who was illegally fishing off the coast of Liberia, and news out of the Sea of Cortez and another attack on Sea Shepherd's vessels which wasn't successful. (2:50) Exciting news breaks about the new development Sea Shepherd has partnered with in creating board shorts out of the illegal nets they have captured. (4:28) He also shares with us the bigger picture of why the Notre Dame fire is a tragedy, where Jana shares with us some of Captain Paul's poetry about the historical site. (11:10) Finishing up Paul's segment, we start to experience some interference where ThatVeganWife takes over and asks the deep question of how Captain Paul Watson deals with the weight of the issues we talk about on this show, to which he gives his own experience and advice. (14:05) Jana & BB Star find connection again where BB shares his new love for Whale Wars on Amazon PrimeVideo which has all 6 seasons. (15:20) THEN, State of the Oceans is blessed by BB's talent where he shares the new State of the Oceans intro that he sang and wrote. (16:40) Jana shares all things EarthX as Captain Paul Watson will be attending. Details about the documentaries being shown (including Sea of Shadows) and info about the event can be found online. (25:00) With a few more technical difficulties, we switch over to talk to ThatVeganWife who shares with us the trend of "uncompassionate vegan culture" where people are less inclined to appreciate all walks of life. We dive a little deeper into a conversation about interdependency, vegan meat/cheese substitutes, and how compassionate vegans really need to be to people who don't get it as they do. (37:09) ThatVeganWife switches the conversation to more insight on what it's like to go through Vegan School, and why she wishes she had this free resource. 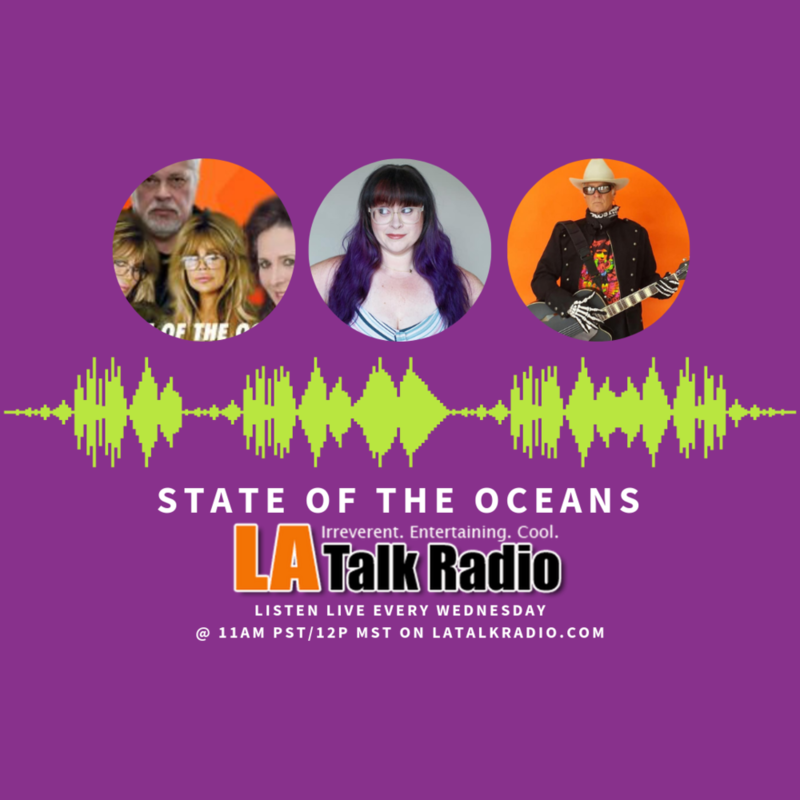 (50:19) Jana & BB Star close out the show with some great resources for new veganners who are looking for ways to contribute to the state of our oceans. (2:57) Captain Paul Watson starts us off with updates from Sea Shepherd missions from around the world which leads to a deeper discussion of what's happening for The Sharpie off the coast of Mexico where Vaquita rescue is happening. Following is news from the Sam Simon which is working to bring attention to the mistreatment of dolphins off the coast of France, and the upcoming films featuring Captain Paul Watson including Sea of Shadows, Watson, Seaspiracy, and Chasing the Thunder. Final news out of the Japanese Whaling fleet and how there will no longer be commercial whaling in the southern hemisphere from now on. (19:40) Jana introduces Abraham Stern, who is Captain Paul Watson's attorney from Costa Rica who has been successful for justice for Paul. Abraham shares the story of Paul's warrant for arrest in Costa Rica for being falsely accused of killing local fishermen and how he personally put his career on the line to win this case. It's a story right out of Hollywood. Stern also goes into detail what this victory means for Captain Paul Watson and future plans to devote a statue to him & his work for saving Sea Turtles. (42:27) ThatVeganWife closes the show where she talks about her NEW FREE resource, Vegan School, which launched earlier this week! Make sure to learn more & register here. (0:45) Jana introduces our show which leads into (2:02) Captain Paul Watson's Sea Shepherd update where he gives us the news from the in Costa Rica collecting trash; how there was another Vaquita found dead in Mexico, updates on the dolphin slaughter over in Europe, and news out of another major oil spill happened near the Sam Simon where rescue is happening for local affected wildlife. Captain Paul talks about the depleted Herring populations in our oceans, one of the main sources of food for many of the wildlife on land & in oceans alike. Jana catches up with Paul about the exciting news out of Costa Rica & reminds us of Operation Jiro who worked to save sea turtles, but was killed in action. Before Sia introduces our guest, (15:40) she gives a quick shout out to the Disaster Assist Team working & helping with Midwest Floods. (19:00) Introduction of Patrick Battuello who is a writer, animal-rights activist, and the founder and president of Horseracing Wrongs, a 501(c)3 non-profit dedicated to ending the cruel and deadly horse-racing industry in the U.S. He is the nation's foremost expert on racehorse deaths. He gives us the inside scoop what what racing horses actually go through and what's being done to stop it. Check out the stats & numbers behind the industry on HorseracingWrongs.com. (58:00) After an insightful conversation with Patrick, Sia & Jana, ThatVeganWife closes out the show with a promotion for her Free Resource: Vegan School, a NO BS video training with tips & tricks for aspiring vegans. **Special Note: The first half of show we experienced some technical difficulties with our host, so thank you for your patience! It gets better & less distracting as the show goes on & during our special guest segment. (00:45) Richard Couto fills in for Jana this week as our special guest host introducing our hosts of the day & special guest, NikkiVegan. We start off hearing from our main host, Captain Paul Watson who has exciting news out of Costa Rica upon the dropped charges against him which were 8 counts of attempted murder/assault from 17 years ago! He goes on to share details of what this actually looks like for Sea Shepherd and his own ability to travel to Costa Rica. (14:25) Captain Paul tells us more about other world-wide efforts such as the located Sea of Cortez & France (where dolphin slaughter is happening), which leads us to conversations about insight into what it's like to work with local government on social activists issues. (18:17) ThatVeganWife asks Captain Paul Watson a question pointing to topics of "unethical vegan nutritional sources" and the mistreatment of nations & workers harvesting sources like quinoa & soy for tofu. (23:00) Richard Couto gives his own answer in regards to the myth in protein & the mis-education behind nutrients and how the impact our bodies, as well as where they come from. (26:55) ThatVeganWife introduces our guest, Nicole, a YouTube creator with, channel "NikkiVegan," author of the ebook 30 Vegan Breakfasts, and co-host o the weekly YouTube talk show The Vegan View. She comes on to share her story, what inspired her "untraditional" activism, and a (35:45) listen in on what she eats in a day as a busy, entrepreneurial millennial. You'll want to take some notes and make sure to check out her Youtube Channel for more realistic vegan recipes you can actually make yourself. No fads, just food here! (00:45) Jana introduces our show which leads into the first segment with Captain Paul Watson, co-founder of GreenPeace & Sea Shepherd Global who shares with us news from the seas. (2:30) He starts off by talking about his time in Florida for the documentary, Sea of Shadows, continued updates on dolphin slaughter by The French Fleet using gill nets to kill dolphins throughout France, and more updates out of New Zealand, the Sea of Cortez, and Panama which leads into further questions. (5:34) The best news is that Sea Shepherd had the opportunity to show Sea of Shadows to the United Nations. (10:15) Then we move to our guest host, Richard Couto, who joins us after his time hanging out with Captain Paul and the documentary showing at the film festival in Miami. He also brings us some news out of ARM Investigations regarding behind-the-scenes footage of the tough conditions animals face in light of factory farming & animal agriculture. (25:25) ThatVeganWife introduces our guests from The Veganizers, Kiki (the Veganizer founder), Waz (The Veganizer Portland Director), and Sarah (the Veganizer Denver Director), who they are & why they started The Veganizers. The rest of the show is filled with questions & input from our hosts. This is an incredible show packed with so much value, so you'll want to listen to the entire thing! (0:44) Show Introduction by Jani of the Jungle leads us into updates by Captain Paul Watson (2:47) & what's happening with Sea Shepherd. Including updates about progress in improvement to prevent attacks at a Vaquita refuge; some good news in Liberia where Sea Shepherd has been cleaning out poachers from Liberian waters; the Sam Simon working to interfere with Dolphin rescue; and good news in Scotland with the shooting of Seals & Salmon netting with questions from the other hosts to follow. (10:30) ThatVeganWife introduces our guests, Mark & Rayne who are authors, creators, & producers of the Skaana podcast which focuses on capturing the life of Orcas & the science behind their miraculous lives. We get the inside scoop behind how they started the podcast, how they got involved in Orca rescue, as well as some fun things Mark is working on, including a new children's book! (48:20) ThatVeganWife closes the show with her "Vegan Minute" updating us on some good news of a friend who just recently made the switch to a vegan lifestyle after being diagnosed with Fibromyalgia who was recommended her going plant-based. You don't want to miss the end! Mark Leiren-Young is author of 'The Killer Whale Who Changed the World' and the upcoming new book, 'Orcas Everywhere;' he was ALSO the Director of The Hundred-Year-Old Whale, and currently hosts the Skaana podcast. Rayne Benu who is the producer of Skaana podcast and Cinematographer of The Hundred-Year-Old Whale! Happy New Year, everybody! It's 2019 and we're starting off with an exciting show and a great guest! (1:55) Captain Paul Watson is back with breaking news over the holiday. That including: the end of whaling in the Southern Ocean and facts about the immense decrease in phytoplankton & fish population. (18:40) BB Starr introduces our guest, Terri who's a local hero in the Texas Hill Country involved in TNR. Terri enlightens us on her process of containing a '100 cat per capita' population using the humane action of Trap Neuter Release methods. (40:20) ThatVeganWife shares practical tips for listeners who are looking to #GoVegan in 2019 and shares a little bit about her 3 year journey into the vegan lifestyle. Click here to learn about State of the Oceans & listen to past recordings. CLICK HERE to Learn More & Support Terri with TNR efforts.